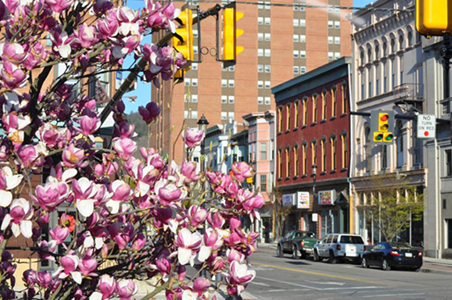 Largely residential, 84 percent of the Tamaqua Historic District contributing buildings are dwellings that date primarily between 1850 and 1930, with earlier and later examples scattered throughout the district. More than 37 percent are duplexes and 12 percent are row homesn Nearly all are under private ownership and located on narrow lots. The remaining 30 percent are single family homes, which tend to sit on somewhat larger lots with wider side yards than the attached homes. Queen Anne homes dominate both in high style, single-family dwellings and vernacular duplexes. Other represented styles include Greek Revival, Italianate, Craftsman (bungalow and cottage), Second Empire, American Foursquare, Colonial Revival, Tudor Revival, Mission, and Prairie. Many homes are a mix of several styles. The majority of the district’s contributing dwellings are vernacular, with decorative elements from styles popular at the time of their construction. Decorative art glass is widespread in the district in both high style and vernacular examples. 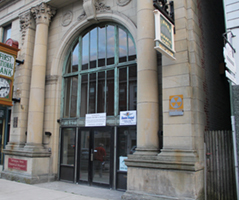 Early residential examples are relatively scarce. Surviving early settlement vernacular buildings include the 1801 Burkhardt Moser log home at the rear of 307 East Broad Street, and a few homes in the vicinity of The White Swan Hotel at 256 Cedar Street, including 252 Cedar Street, a circa 1860 brick home with Georgian segmental arched roof dormer. 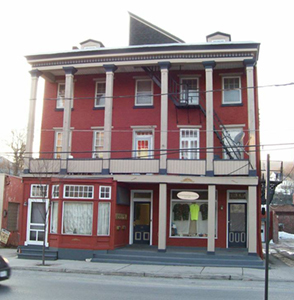 101 Market Street is a circa 1850 brick example located across Mauch Chunk Street from the 1827 Little Schuylkill Hotel. Extremely rare Victorian vernacular miners cottages dating from circa 1860 are found in a row at 124-132 West Cottage Avenue. Many mid-nineteenth century a nd Late Victorian examples are found. Rare mid-nineteenth century high style residential examples of the Greek Revival style include identical brick townhouses at 320 and 326 West Broad Street; a brick townhouse at 30 Nescopec Street with attic story windows and intact Greek Revival door surrounds; and 224 West Cottage Avenue, a frame high style example with full columned porch and side dependencies. Intact Victorian Gothic Cottages are found at 236 West Broad Street and 34 Market Street. 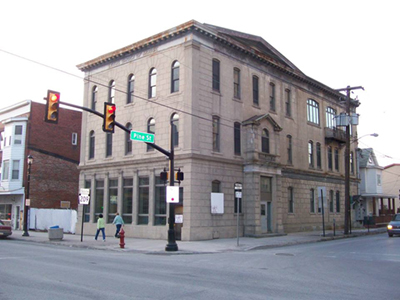 Excellent examples of high integrity and varied Victorian detail are scattered throughout the district including an 1850 Italianate double at 210-212 West Cottage Avenue; a Second Empire/Eastlake staggered row group at 228-250 Mauch Chunk Street; later Second Empire rows with flared Mansard roofs at 101-107 Rowe Street; an ornate Second Empire single dwelling at 206 North Lehigh Street; an ornate Queen Anne/Eastern Stick dwelling at 36 North Greenwood Street with intact stickwork and high imbrication; and a double, also highly shingled, at 204 East Broad Street. A Shingle style example found at 258 West Cottage Avenue has an arcaded porch. Colonial Revival townhouse rows are located at 646-652 East Broad Street. 415 West Broad Street is a unique Free Classic Bungalow with shiplap siding and diamond-shaped shingles. A brick bungalow dating from 1915 with Prairie transom lights and entry doors is at 415 West Broad Street.